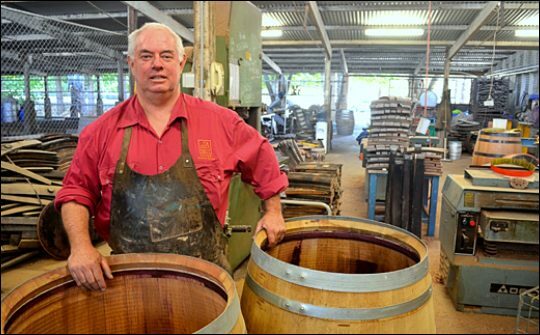 The South Australian’s passion for reclaiming and restructuring barrels has made his work sought after worldwide and helped his clients achieve gold-medal success. But it is a destiny that might not have been. “Some people say I’m an old fossil working with time capsules, but every barrel has a story. After I finished school I picked up a job at Penfolds as a junior cellar hand but every lunchtime I would go and annoy the cooper. I was always interested in woodwork. “One day I was called to the (Penfolds) front office and I thought I was going to be dismissed. Instead they offered me an apprenticeship." Under the tutelage of Grange creator winemaker Max Schubert, Andrew learnt the level of commitment, discipline and innovation that is necessary to make a top-end product. “I wasn’t allowed to use a power tool for the first three years,” he says. That has now become a great asset for Andrew. After 34 years at Penfolds the wine industry took a significant hit and his position was made redundant. But when Seppeltsfield winery owner Warren Randall opened the company’s historic cooper shop, a new chapter started. At the Seppeltsfield site, one hour north of Adelaide, Andrew hand-makes signature barrels for the winery’s acclaimed port. He has even built a machine, completely from farm equipment, to shave the inside of old barrels so they could be reused for wine saving some Japanese clients significant money. However, it is his work for Tasmanian distillery Lark that is a step above - Andrew’s barrels helped Lark claim the gold medal for Best World Whisky at the International Whiskey Competition in Chicago earlier in 2014. Why? Usually after 70-80 years and several cycles of wine and fortified spirits, barrels become nothing more than decoration or a garden planter pot. Instead, Andrew collects the relics, considers the wood grain and saturation, dismantles them, cuts and shapes them to size and then reworks the wood to create a truly unique product. But the “black magic” of his trade is the charcoal. Whiskey barrels are burnt to charcoal inside to give the spirit is colour and a great part of its “caramel” flavour. So Andrew works meticulously to capture the best residual flavour from the barrel’s past life - and enhances it for the future using new techniques. The combination of science, art and innovation has propelled Andrew and Larks Distillery to great heights, but for Andrew it’s still about the simple pleasures.